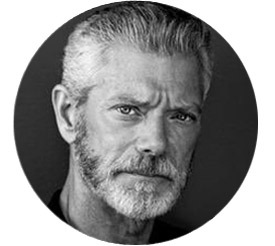 Stephen Lang is an actor and a playwright. His extensive Broadway credits include his Tony-nominated performance in The Speed of Darkness, Happy Loman opposite Dustin Hoffman in Death of a Salesman, A Few Good Men, and Wait Until Dark. Onscreen Stephen is perhaps best known for his roles in Avatar and Gods and Generals; he has also appeared in such films and television shows as Last Exit to Brooklyn, Tombstone, Gettysburg, Public Enemies, and The Men Who Stare at Goats. His one-man show, Beyond Glory, which he wrote, has been performed in Virginia, Chicago, and New York, as well as on a USO tour to military bases and battleships. In the fall of 2010, Stephen received the Patriot Award from the Medal of Honor Society in honor of his theatrical and charitable works for the United States military. Stephen lives in New York and is married to costume designer Kristina Watson.